Nastic actuators are a new type of electroactive polymer (EAP) based on hydraulics: a fluid is pumped by electroosmosis within microchannels in compliant material from one place to another. The hydraulic pressure causes the compliant material to deform. 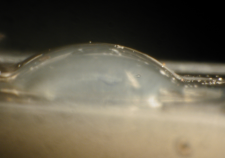 This is an effect that is observed in micro-scale fluid channels. All solid surfaces have fixed charges, which can be either positive or negative. 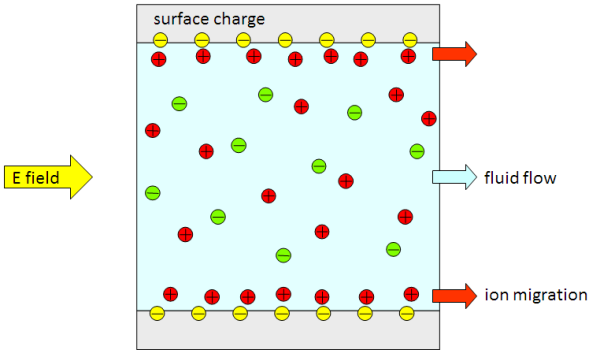 Compensating ions of opposite charge in the fluid move to the liquid/solid interface, creating a "double-layer", quantified by the zeta potential. The compensating ions at the interface are mobile under an electric field, and "drag" the rest of the liquid in the micro-channel. Post-doc Menake Piyasena, with the assistance of undergraduates Robert Newby and Tom Miller, developed a working demonstration device made from PDMS with water as the fluid. The expansion and collapse occur within seconds, with membrane deflections of hundreds of micrometers. 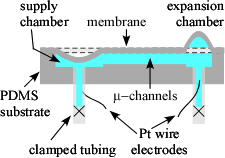 The thin membrane above the expansion chamber deflects upward (see right), and the one above the supply chamber downward, upon application of the electric field. M. E. Piyasena, R. Newby, T. J. Miller, B. Shapiro, and E. Smela, "Nastic actuators: electroosmotically driven microfluidic cells," Sens. Act. B, 141, 263-69 (2009).